Posted on Wednesday, April 11th, 2012 at 12:43 pm. In theaters April 27, 2012: visit www.warriorsoftherainbow.wellgomovies.com for more information! 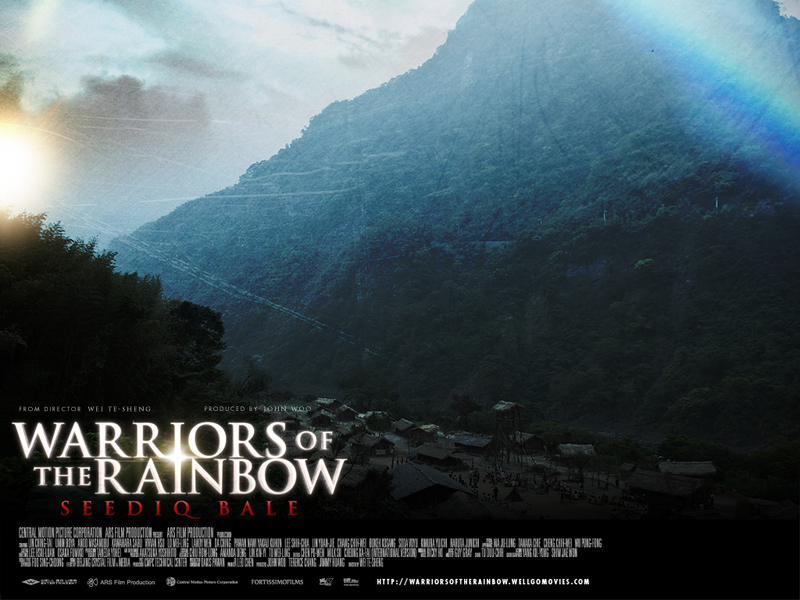 Wei Te-Sheng’s epic film WARRIORS OF THE RAINBOW: SEEDIQ BALE reclaims an extraordinary episode from 20th-century history which is little-known event in Taiwan. Between 1895 and 1945, the island was a Japanese colony inhabited not only by the majority (Han Chinese immigrants) but also by the remnants of the aboriginal tribes who first settled the mountainous land. In 1930 Mouna Rudo, the leader of one of the Seediq tribes settled on and around Mount Chilai, forged a coalition with other Seediq tribal leaders and plotted a rebellion against their Japanese colonial masters. It was to begin at a sports day meeting where the assembled tribesmen were to attack and kill the Japanese officials and would then broaden to sieges on police stations and local government offices in the region. The initial uprising took the Japanese by surprise and was almost entirely successful. But the Japanese soon sent in their army to crush the rebellion, using aircraft and poison gas. The 1895 Treaty of Shimonoseki ceded the island of Taiwan (aka Formosa) to Japan. There was immediate tension between the islanders and their new colonial masters, sparking many small rebellions, but the brutal suppression of the Taiwanese Revolt in 1916 brought an uneasy peace. At that time, the aboriginal tribes of Taiwan – deemed ‘primitive savages’ by the Japanese – were deprived of their lands and their weapons, along with their traditions of head-hunting and face tattooing. The tattooing was an integral part of tribal cultures: in the Seediq tribes, when a young man was given his face-tattoo it signified that he had passed from boyhood to manhood and become a ‘hero of the tribe’ – a Seediq Bale. Despite all of Japan’s constraints on their culture, the aboriginal tribes submitted to Japanese rule for a time. In Wushe, a tribal township on Mount Chilai, the Japanese even set up a school, a post office, a vocational training center … and a branch of the Nenggao Police Ministry. Mouna Rudo was the leader of the Seediq tribe in Wushe. He had sparked small rebellions against the Japanese in 1920 and 1925, but by 1930 seemed resigned to accepting Japan’s rule. Thinking that they had ‘tamed’ the savages, the Japanese reduced the number of policemen stationed in Wushe. During the ‘phoney peace’ of 1930, however, Pihu Sapu and other tribesmen from Hogo village persuaded Mouna Rudo to launch an ambitious new rebellion. They secretly lobbied other Seediq villages in the region and formed an underground alliance of six villages: Truwan, Mahebo, Bualon and Suku joined Wushe and Hogo in planning a surprise attack on the Japanese. The alliance mustered more than three hundred able-bodied fighting men in total. The plan was to strike on October 27th, the day of a school sports meeting in Wushe, when the Commissioner for Nenggao and other high-ranking Japanese officials would be in attendance. The tribal army split into several teams to launch surprise attacks on all the region’s police stations; they then converged to surround Wushe and massacre every Japanese in sight. The action was swiftly accomplished: 136 Japanese men and women were killed. There were 428 Chinese-Taiwanese living in Wushe at the time, and only two of them were killed, both by accident. It was a carefully planned and executed rebellion, nothing like a traditional tribal head-hunting attack. In the days that followed, the Seediq rebels set fire to their own homes and villages. The Japanese were confounded and overwhelmed. When the police and army squads sent to crush the rebellion failed, the Japanese authorities tried to bribe the Seediqs to turn against the rebels. But the rebellion continued for fifty days. It is said that more than one hundred Seediq women hanged themselves during the rebellion in order to free their husbands from the burden of taking care of them. Defeated in ground combat, the Japanese resorted to dropping poison gas on the rebels from aircraft – in breach of international conventions. The gas bombs caused some rebels to surrender and others to commit suicide. Mouna Rudo saw that the rebellion could go no further and instructed the members of his family to kill themselves. He personally shot his wife and two grandsons and then hid up the mountain, hoping that the Japanese would never find him. His eldest son Tado Mouna fought to the last bullet and then hanged himself, along with other rebels. The ‘Wushe Incident’ – as the Japanese dubbed it – finally ended when one of the ringleaders, Pihu Sapu, was captured. It was a full fifty days after the sports day massacre. The Japanese soon exacted their revenge. They first mounted ‘The Second Wushe Incident’: the execution of more than 200 captured rebels, designed to deter any further uprisings. They then moved all surviving Seediq tribespeople to an offshore island (they named it Kawanaka-hara-jima) connected to the mainland only by a flimsy suspension bridge. The Seediqs were finally isolated and contained. Would like to know where I can rent, own or see this film. I live in Northern California, Bay Area and did not have a chance to see this film at the AMC Metreon 16 theaters. Any help would greatly be appreciated. We recommend searching http://amazon.com for either the US version or the original length Taiwanese version.